End of Page Slide Out Box is a feature in which the reader of the article will be shown a sliding box at the bottom right hand side of the screen as he reads and comes to the bottom of the screen. 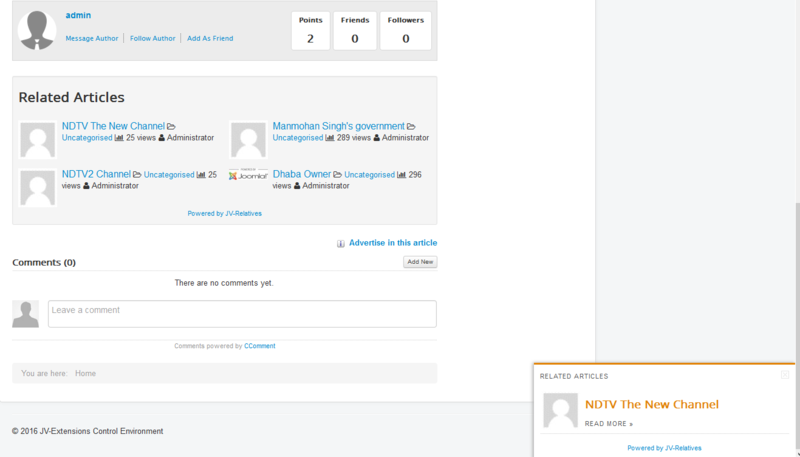 This box will contain the related articles list, and will come up only when the user scrolls to the bottom of the page. In this article, you will learn how to configure this feature. In the box, you can also decide to show article tags and social media buttons in this box! You can also decide to show the plugin/module output and the slide out box, or just one of them only. You can configure the settings of this box from Component configuration. For this box to work, you need to enable the module or the plugin in addition to enabling this feature in component configuration. If you want only the fly out box and not the module or plugin output, then you still need to enable module or plugin, but need to set Yes to "Exclusive Output?" in "End of Page Slide Out Box" settings in JV-Relatives component configuration.